In a medium bowl, whisk together the cocoa and boiling water until smooth. Allow it to cool to room temperature, then gently whisk in the vanilla and eggs. It will be fluid. In a mixer bowl or other large bowl, combine the cake flour, sugar, baking powder, and salt. Using the paddle attachment, mix on low speed for 30 seconds to blend. Add half the chocolate paste and the butter and mix until the dry ingredients are moistened. Increase the speed to medium if using a stand mixer, or high if using a hand-held mixer, and beat for 1 minute to aerate and develop the structure. Scrape down the sides of the bowl. Gradually add the remaining chocolate paste in two batches, beating for 20 seconds after each addition to incorporate the ingredients and strengthen the structure. Scrape down the bowl. With a rubber spatula, fold in the optional chocolate mini chips or bittersweet chocolate. Bake for 50 to 60 minutes or until a wooden toothpick inserted in the center comes out clean. An instant-read thermometer inserted into the center will read about 200°F. Tent loosely with buttered foil after 25 minutes to prevent overbrowning. Set the bread on a wire rack to cool for 10 minutes. Loosen the sides of the bread with a small metal spatula and invert it onto an oiled wire rack. Reinvert so that it is top side up and cool completely. 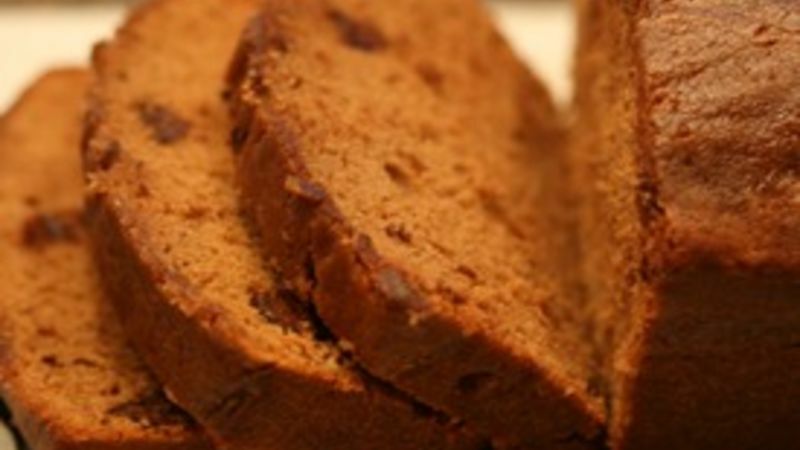 For an extra-moist cake and a subtle background coffee accent, brush the bread with coffee syrup. To make the syrup, in a small pan, stir together 1/4 cup water and 2 tbsp sugar. Bring to a full rolling boil, stirring to dissolve the sugar. Cover and remove from the heat. When the syrup is cool, add 1 tbsp Kahlua. As soon as the bread is removed from the oven, brush half the syrup onto the top. Let the bread cool for 10 minutes, then invert it onto a lightly oiled rack and brush the bottom and sides with the remaining syrup. Reinvert it to finish cooling top side up.